Compositions, usually rhythmical, in which certain letters (generally the first or last of each line), taken consecutively, form a name, phrase, or sentence. Several instances of alphabetical Acrostics occur in the Hebrew Bible. According to Pesiḳta Rabbati, § 46, ed. Friedmann, p. 187, the first verse of Ps. xcii. is an acrostic on the name Moses. Acrostics are usually held to be of late date, but if Bickell and Gunkel have rightly detected traces of an alphabetical arrangement in Nahum, i. ii. and iii., it follows that the Hebrew acrostic is at least as old as the seventh century B.C. On the other hand, the attempt to discover nominal Acrostics in the Hebrew Bible has not been successful. Much ingenuity has been expended on the endeavor to find the name of God acrostically in the Book of Esther. Two suggestions, made by Lagarde and Luzzatto, have, however, some plausibility; namely, "Pedahel" (end of Ps. xxv.) and "Simon" (Ps. cx. 1-4). The Simon referred to might be Simon the Maccabee (142-135 B.C.). See Lagarde, "Symmicta," i. 107; Gunkel, in Stade's "Zeitschrift," xiii. 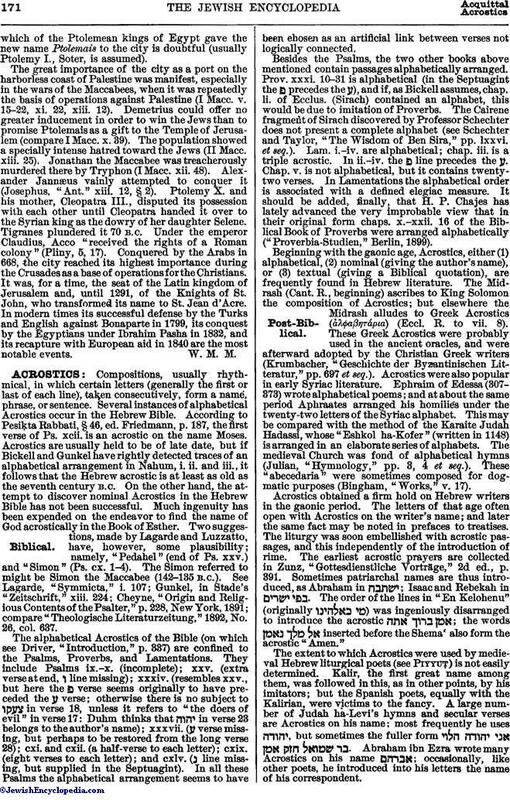 224; Cheyne, "Origin and Religious Contents of the Psalter," p. 228, New York, 1891; compare "Theologische Literaturzeitung," 1892, No. 26, col. 637. The alphabetical Acrostics of the Bible (on which see Driver, "Introduction," p. 337) are confined to the Psalms, Proverbs, and Lamentations. They include Psalms ix.-x. (incomplete); xxv. (extra verse at end, ו line missing); xxxiv. (resembles xxv., but here the פ verse seems originally to have preceded the verse; otherwise there is no subject to in verse 18, unless it refers to "the doers of evil" in verse 17: Duhm thinks that in verse 23 belongs to the author's name); xxxvii. ( verse missing, but perhaps to be restored from the long verse 28); cxi. and cxii. (a half-verse to each letter); cxix. (eight verses to each letter); and cxlv. (ג line missing, but supplied in the Septuagint). In all these Psalms the alphabetical arrangement seems to have been chosen as an artificial link between verses not logically connected. Besides the Psalms, the two other books above mentioned contain passages alphabetically arranged. Prov. xxxi. 10-31 is alphabetical (in the Septuagint the פ precedes the ), and if, as Bickell assumes, chap. li. of Ecclus. (Sirach) contained an alphabet, this would be due to imitation of Proverbs. The Cairene fragment of Sirach discovered by Professor Schechter does not present a complete alphabet (see Schechter and Taylor, "The Wisdom of Ben Sira," pp. lxxvi. et seq.). Lam. i.-iv. are alphabetical; chap. iii. is a triple acrostic. In ii.-iv. the פ line precedes the . Chap. v. is not alphabetical, but it contains twenty-two verses. In Lamentations the alphabetical order is associated with a defined elegiac measure. It should be added, finally, that H. P. Chajes has lately advanced the very improbable view that in their original form chaps. x.-xxii. 16 of the Biblical Book of Proverbs were arranged alphabetically ("Proverbia-Studien," Berlin, 1899). Beginning with the gaonic age, Acrostics, either (1) alphabetical, (2) nominal (giving the author's name), or (3) textual (giving a Biblical quotation), are frequently found in Hebrew literature. The Midrash (Cant. R., beginning) ascribes to King Solomon the composition of Acrostics; but elsewhere the Midrash alludes to Greek Acrostics (ἀλψαβητάρια) (Eccl. R. to vii. 8). These Greek Acrostics were probably used in the ancient oracles, and were afterward adopted by the Christian Greek writers (Krumbacher, "Geschichte der Byzantinischen Litteratur," pp. 697 et seq.). Acrostics were also popular in early Syriac literature. Ephraim of Edessa (307-373) wrote alphabetical poems; and at about the same period Aphraates arranged his homilies under the twenty-two letters of the Syriac alphabet. This may be compared with the method of the Karaite Judah Hadassi, whose "Eshkol ha-Kofer" (written in 1148) is arranged in an elaborate series of alphabets. The medieval Church was fond of alphabetical hymns (Julian, "Hymnology," pp. 3, 4 et seq.). These "abecedaria" were sometimes composed for dogmatic purposes (Bingham, "Works," v. 17). Acrostics obtained a firm hold on Hebrew writers in the gaonic period. The letters of that age often open with Acrostics on the writer's name; and later the same fact may be noted in prefaces to treatises. The liturgy was soon embellished with acrostic passages, and this independently of the introduction of rime. The earliest acrostic prayers are collected in Zunz, "Gottesdienstliche Vorträge," 2d ed., p. 391. Sometimes patriarchal names are thus introduced, as Abraham in ; Isaac and Rebekah in . The order of the lines in "En Kelohenu" (originally ) was ingeniously disarranged to introduce the acrostic ; the words inserted before the Shema' also form the acrostic "Amen." The extent to which Acrostics were used by medieval Hebrew liturgical poets (see Piyyuṭ) is not easily determined. Kalir, the first great name among them, was followed in this, as in other points, by his imitators; but the Spanish poets, equally with the Kalirian, were victims to the fancy. A large number of Judah ha-Levi's hymns and secular verses are Acrostics on his name; most frequently he uses , but sometimes the fuller form . Abraham ibn Ezra wrote many Acrostics on his name ; occasionally, like other poets, he introduced into his letters the name of his correspondent. Some writers wove into their verses Acrostics consisting not only of their own names, but of long, continuous passages from Scripture introduced word by word (these are referred to above as textual Acrostics). A very elaborate instance is Simon b. Isaac's piyyuṭ (for the seventh day of Passover). A special kind of acrostic was the repetition of the same initial throughout the composition. 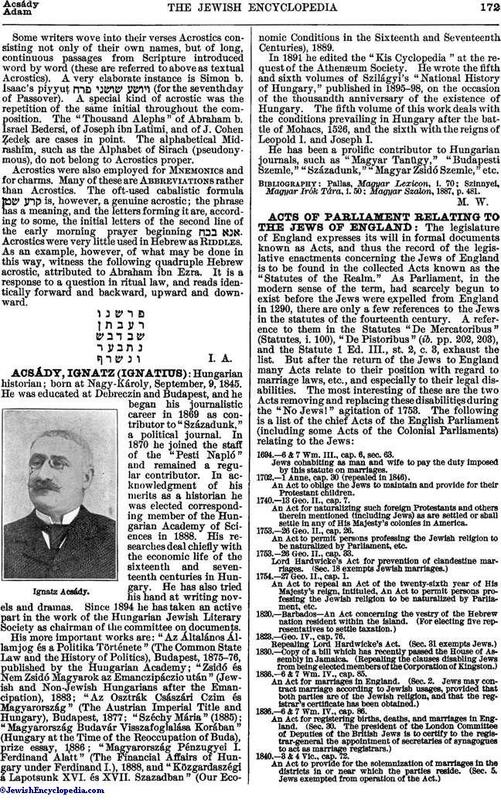 The "Thousand Alephs" of Abraham b. Israel Bedersi, of Joseph ibn Latimi, and of J. Cohen Ẓedeḳ are cases in point. The alphabetical Midrashim, such as the Alphabet of Sirach (pseudonymous), do not belong to Acrostics proper. Acrostics were also employed for Mnemonics and for charms. Many of these are Abbreviations rather than Acrostics. The oft-used cabalistic formula is, however, a genuine acrostic; the phrase has a meaning, and the letters forming it are, according to some, the initial letters of the second line of the early morning prayer beginning . Acrostics were very little used in Hebrew as Riddles. As an example, however, of what may be done in this way, witness the following quadruple Hebrew acrostic, attributed to Abraham ibn Ezra. It is a response to a question in ritual law, and reads identically forward and backward, upward and downward.